We have received reports of large numbers of buffalo gnats, also known as black flies, attacking people particularly in western Illinois. 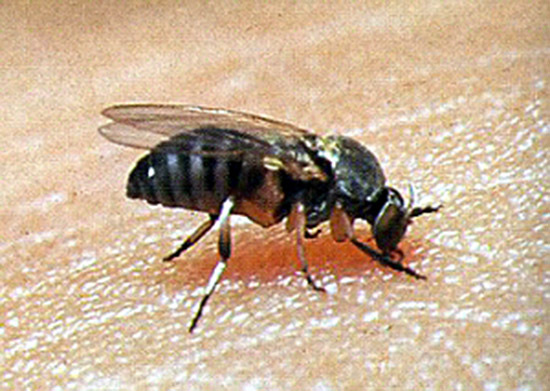 Buffalo gnats are small, 1/16- to 1/8-inch-long, humpbacked black flies. They bite exposed skin, typically leaving a small, red welt. When the gnats are numerous, the toxins from their bites can kill poultry and other birds. They feed on the thinly haired areas of dogs, cats, and horses, such as ears and undersides. There are a number of species that occur in Illinois, and some species are relatively specific to host. With this host specificity, one type of animal may be attacked much more than others. Only in the last few years have we had common human-biting species. Many buffalo gnat species live as larvae in clear, fast-moving streams and feed by filtering food from the water. With the public activity in reducing water pollution and associated federal and state water protection legislation over the past few decades, the streams, rivers, lakes, and ponds of Illinois are becoming clean enough to support life that has been much reduced since the 1930s. Although there are species of buffalo gnats that live in eutrophic, nutrient-laden water, increases in human-biting species has coincided with measurably-cleaner streams. Adult buffalo gnats can fly from 7 to 15 miles from their source; but generally, Illinois residents that are bothered live within a half mile of the stream producing the flies. Although there are reports of DEET-containing insect repellents not being effective, scientific literature reports that DEET repellents provide the most effective protection. In areas with high populations of buffalo gnats, people commonly wear head nets, hats with insect protective netting that covers the head down to the shoulders. These are sold in sporting goods stores. Unlike mosquitoes, buffalo gnats do not bite through clothing, so only exposed skin is susceptible to attack. They also do not enter buildings.